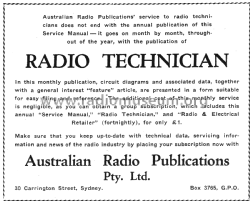 RADIO TECHNICIAN commenced as a 16 page monthly supplement in the Australian Radio Publications Pty. Ltd. publication of 'Radio and Electrical Retailer' on 27 January 1939 and later became a separate publication costing 5/- per annum. It was intended as a reference to radio circuits and troubleshooting and incorporated many of the features from Radio Review, which had ceased some time previously. The radio data was then incorporated within Radio Retailer but there seemed to be a need for a separate specialised publication of servicing information, so Radio Technician was born. Click here for the 12 models documented in this literature, i.a.